The main page of the gradebook offers an overview of all the course assessments. It provides a complete list of all published assignments, tests, offline items, and gradable discussions. Golden Rule: Etudes shows all gradable published / posted assessments to students and instructors, if they are set to be sent to the gradebook, regardless if they are closed, not yet open, or hidden. Scores are displayed once they are released. 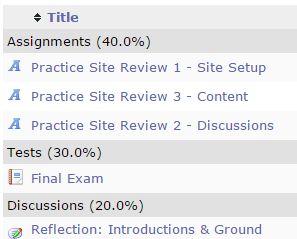 A summary at the top of the Overview page of the gradebook informs you of the total number of published assignments and the total points or weight % possible in the course. By default, assessments are grouped and listed by category automatically, based on what type they are (i.e. Assignments, Tests, Discussions, Offline Items, and Extra Credit). You can see the open and due date for each assessment, as well as the number of students with released submissions and the average performance in each. These values are based on graded and released submissions only. To change the placement of an assessment into another position or even to another category, you can use drag-and-drop or the numeric drop-down menus on the far right of the page. Remember to save! 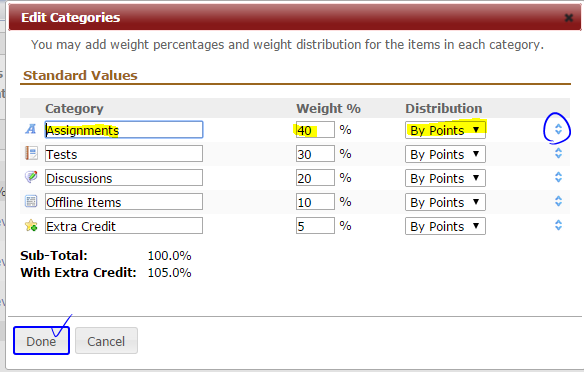 To change the order categories are listed in your gradebook, click on the Edit icon to the right of a category. A window will open that allows you to change the title of any category, its weight and its position. Click on Done to save your changes and close the editing window.